[easyazon_link identifier=”B00DZP1C9K” locale=”US” nw=”y” nf=”y” tag=”rabidreaders-20″]The Uninvited[/easyazon_link] was a groundbreaking film in the haunted house genre. It was the first time that the idea of a house occupied by past occupants was treated with a serious tone. Rick and Pamela smell haunting perfume and feel chills in hobby-specific areas of the house to former occupants that have passed on. Interpreting these strange occurrences for Rick and Pamela is Stella (brilliantly played by Gail Russell), granddaughter of the man that sold the house and whose mother died in the mansion. Stella is really the defining force of the story. She is obsessed with the house and her illusion of connection. The spirit does protect her and even possesses her at one point in the film. We soon discover that perhaps the haunting isn’t motivated by what might seem obvious. Russell turns in a luminous performance that gives credibility to an older sophisticated man like Rick Fitzgerald becoming entranced with her. The overall story and acting of [easyazon_link identifier=”B00DZP1C9K” locale=”US” nw=”y” nf=”y” tag=”rabidreaders-20″]The Uninvited[/easyazon_link] was seamlessly and intelligently written so that it not only was the first of the genre, it became the gold standard. There are not many special effects and no haunting danger-is-coming music. The all-star cast that includes well-known character actors Donald Crisp ([easyazon_link identifier=”B00011D1OK” locale=”US” tag=”rabidreaders-20″]Mutiny on the Bounty[/easyazon_link]), Alan Napier ([easyazon_link identifier=”B000N54NGO” locale=”US” tag=”rabidreaders-20″]Batman[/easyazon_link]) and Barbara Everest ([easyazon_link identifier=”B004H0ZHD4″ locale=”US” tag=”rabidreaders-20″]Upstairs Downstairs[/easyazon_link]). The story was based on Irish author, Dorothy Mccardle’s “Uneasy Freehold” now titled [easyazon_link identifier=”0892440686″ locale=”US” tag=”rabidreaders-20″]The Uninvited[/easyazon_link] (a book I have desperately wanted to read for a while now). 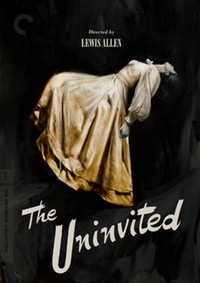 If you have not seen [easyazon_link identifier=”B00DZP1C9K” locale=”US” nw=”y” nf=”y” tag=”rabidreaders-20″]The Uninvited (Criterion Collection)[/easyazon_link], pick it up today. It is a classic and one of the best examples of early psychological horror in film.